If you are familiar with the song or with the pawpaw, you know that it won't fit into your "pocket" unless that pocket is an old-fashioned apron to which the song refers. You may not find pawpaw (Asimina triloba) fruit on the grocery shelf because the season lasts a short time and the fruit lasts only a few days. It makes for a temperamental harvest. Full disclosure: I was nowhere near the pawpaw patch. Living in a small town, and having a reputation for cooking and eating ANYTHING, I am often the recipient of foodstuffs that no one else want to bother with. Yesterday I got three bags of pawpaws in various states of ripeness. One school of thought would have you believe that you need to wait till the pawpaw falls from the tree, but frankly, by that time they are over-ripe. Pick them when they have that "avocado" feel to them - a few brown spots and a gentle give should put them about ripe. Alas, most of bags were filled with the over-ripe variety, but I was able to salvage about 4 cups of pawpaw pulp. The pawpaw is often called a Custard Apple because of its soft, custard-y flesh, but actually the custard apple is the same genus -- different species as are the cherimoya and the sweetsop. The name is probably derived from its similarity to the word papaya and the belief that the pawpaw was a similar type of fruit though the papaya is a different genus. The pawpaw has many a banana nom de plume including the Poor Man's banana, the Hoosier banana, the Indiana banana and the West Virginia banana. Mashed up it does have that over-ripe banana consistency, though the taste of the pawpaw is a bit more melon-y. 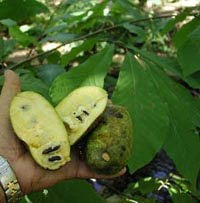 The pawpaw is the state fruit of Ohio and the largest edible fruit native to North America. With this plethora of pawpaw goodness, I made a cake and some preserves. 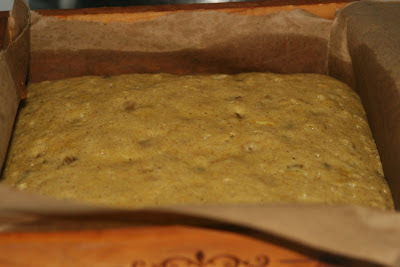 The cake was my usual kind of moist, fruit cake made in one of my cake boxes. 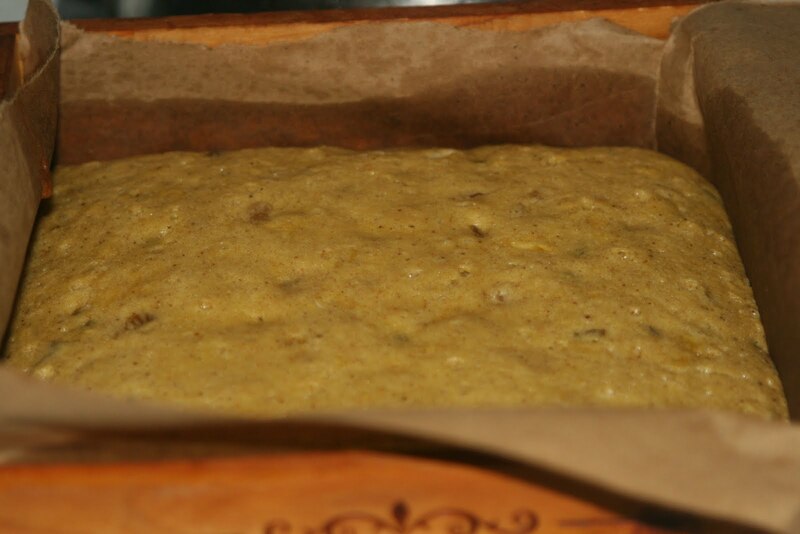 The recipe can be made in loaf pans or any pan that is about 8 inches across and lined with parchment or brown paper. 2. Add eggs, one at a time, until fully incorporated. 3. 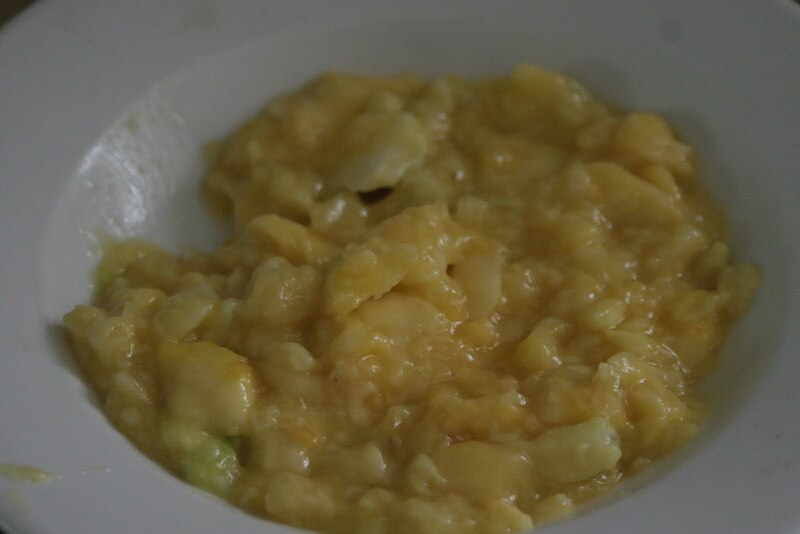 Mix the pawpaw pulp and the milk, in a small bowl. 4. In another bowl sift the flour, salt, baking soda, and quatre épices. 5. Alternate the pulp mixture and the flour mixture into the batter until fully incorporated. 7. 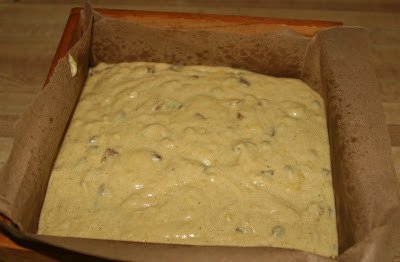 Pour the batter into a prepared Lucinda's Wood Cake Box. 8. Bake at 300 for 90 minutes. 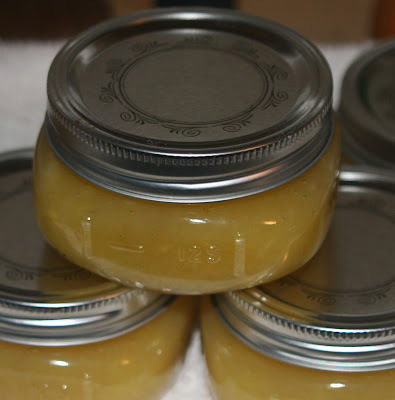 My other recipe was for pawpaw jam. This jam has an "order-by-mail" ingredient in the recipe. I live in a remote area and often get ingredients through the mail. This recipe calls for a soft diced ginger available at King Arthur's Flour. I love ginger. It is fairly easy to find candied ginger, but this product from King Arthur is sublime. Seriously, it is one of those things that one might be tempted to eat right out of the carton with a spoon. It is beyond versatile. A teaspoon in a cake, cookies, marinade, salad dressing... the list is as long as your imagination. If you love ginger and cook with it often, this is a must have! Mix all the ingredients into a confiture pan or other non-reactive pan. Bring to a rolling boil. When a candy thermometer reaches 220 F., remove from heat and pour into sterilized jars. Process for 10 minutes. Still want more pawpaws? Check out Cookbook Of The Day. This is all fascinating because I didn't know anything about pawpaws. The cake and jam look wonderful. Awesome fruit I wonder if it tasted good anyway interesting recipe!